It's the Christmas season and everyone is scouting for dishes to prepare to entertain guests on Christmas day! Well, I wasn't left out! I also went in search of a nice and tasty dish to surprise guests. After my search, I found RISOTTO RICE!! Yeah, I know its not much but I'm going with it. 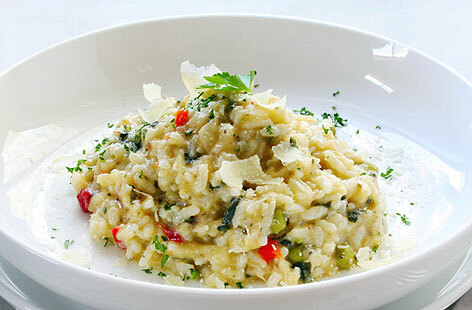 Risotto is an epitome of Italian home cooking and comfort food. But we are bringing it down and making it the Nigerian way! It is one of those dishes rich, satisfying, easy to prepare, and never fails to impress. 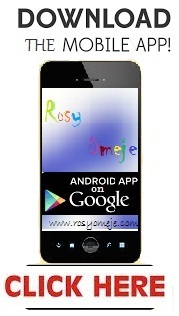 That's why I chose it and would like to share the preparation with you. Risotto is more of a technique than a dish. Once you get the basic steps from making the spices/stock, toasting the rice, and adding in the broth a scoop at a time, you are good. From there you can experiment by adding other vegetables or flavors or sausages or wild mushrooms or even other types of grains. 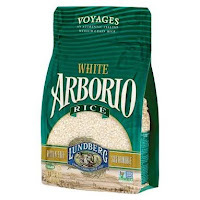 For this recipe, I'll be using Arborio rice. One important thing to note is that you must have everything ready before you turn up your heat source! So, let's get cooking with two different methods! - Place selected meat in a pot after washing, add sliced onions, spices and enough water to cook it till done. Set on the stove and allow to cook well. Remove when done and keep stock for use later. - Finely chop more onions and set aside. - Heat 2 tablespoons of olive oil and a 1 tablespoon of butter in a pan, add the onions and fry until light brown. - Add the meat and fry for some minutes until it starts to crisp. You can take it out if you want it that way or leave in the pot to cook with the rice. - Add the rice and stir then add stock and bring to boil. Check if you need to add more spices to suit your taste. - Stir well with a wooden spoon to avoid burning, then reduce the heat and cook for 15-20 minutes until the rice is almost tender. - Stir in the peas, add a little salt and pepper and cook for some minutes, until the peas are cooked. - Serve immediately sprinkled with freshly sliced cucumbers, parsley or other garnishes you choose. - Boil the meat in spiced water till done. Set stock aside for use later. Alternatively, you can boil different vegetables in spiced water for some minutes and use the stock if you (or your guests) are vegetarian. - Heat 1 tablespoon of unsalted butter and 1 tablespoon of vegetable or olive oil in a heavy bottomed saucepan, add chopped onion, cook on medium heat until the onion is translucent. - Add the uncooked Arborio rice and stir briskly, coating the rice grains with the hot butter and oil. - Sauté the rice for a minute or two. But the rice shouldn't look brown or toasted. - Add about 1/2 cup of white wine to the rice, and stir until it is fully absorbed. Take your time because it needs to be fully absorbed. The wine helps liven up the flavors of the risotto. - Add a ladle of hot meat/vegetable stock and stir until the liquid is absorbed. 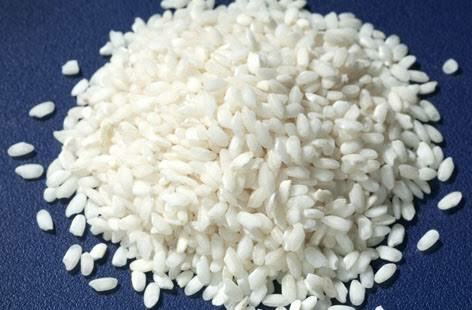 When the rice appears almost dry, add another ladle of stock and repeat the stirring. It's important to stir constantly, especially as the liquid gets absorbed to prevent scorching. Continue adding more ladles of hot stock and stirring the rice while the liquid gets absorbed. 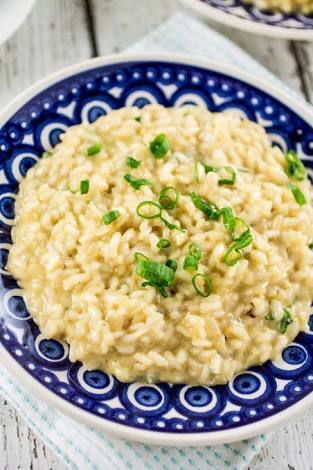 You'll see your risotto take on a creamy consistency as the rice cooks and begins to release its natural starch and flavor. 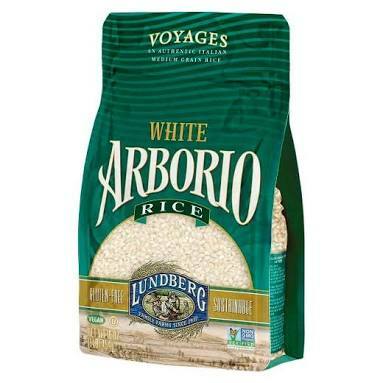 That's the magic of Arborio rice. - Total cooking time will be 20 to 30 minutes. The risotto is done when the grains are tender but still firm to the bite, without being crunchy. - Note that 2 cups of uncooked Arborio rice should absorb 5-6 cups of stock. If for some reason, you've added 6 cups of stock and the risotto still isn't done, you can finish the cooking using hot water instead of stock. Just add the water as you did with the stock, a ladle at a time. This is to prevent it from been too spicy. But if you want a spicy rice, go on with the stock. - Stir in the remaining butter and vegetable oil. You can also stir in some finely sliced cucumbers or carrots. And adjust the seasoning if necessary. 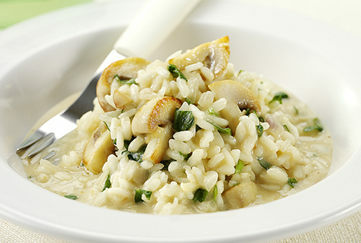 - Serve immediately because Risotto turns sticky and gluey if it's held too long in the pot or fridge. YAY!! If you are on my guest list this Christmas, prepare to be wowed! Your taste buds would thank you for stopping by! Oh! And the desserts include Spring Rolls and Chocolate Balls. This Christmas is gonna be a 'foody' experience! lol! I'll love to hear your own Christmas food experience in the comment box below. But, must one really prepare a rice dish? My family has moi moi and pap on the menu for Christmas! Lol.. I've actually given that a thought before. Seriously, I don't think rice is a compulsory meal for Sundays or feast days. I think it's because rice is a generally accepted dish everywhere by everyone so it's better to have it around so you won't get stranded when you get a visitor who doesn't eat your own native meal. But all the same, moi moi is a great choice. Visitors or not, everyone is allowed to cook whatever they choose! YAY!! 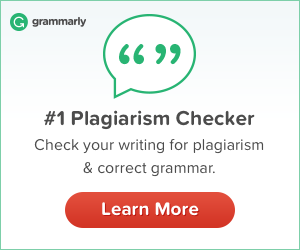 I followed your recipe and I was able to make my very own Christmas risotto at home. Though I also made jollof rice for guests who may not be thrilled by the idea of trying a new rice on Christmas.! Happy Christmas to you and your family.